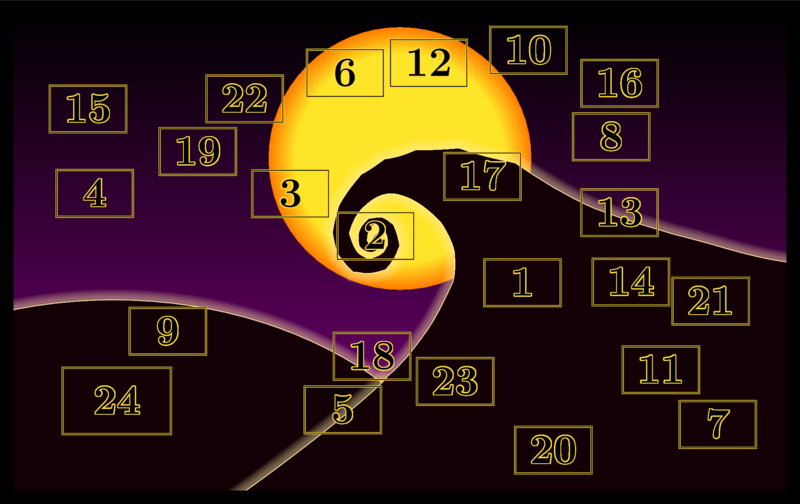 While thinking about creating an own Advent Calendar for the beloved people around me – instead of buying a boring one with chocolate in it – a thought came to my mind: "How would I draw this in TikZ?" And since I will go a different way this year and don't have time to realize a LaTeX version, I thought I could make it a challenge for the community. On a rectangular field, create 24 randomly distributed "windows" (represented by simple rectangles) that are labelled from 1 through 24. The windows with number 1 through 23 shall be equal in size and aspect ratio, window number 24 can have a different aspect ratio but should cover about twice the area of the other ones. It has to be made sure that no two windows are touching or even overlapping. The placement of the windows shall be computed at runtime via random number generation (not from values somehow hard coded into the document), i.e. every LaTeX run should generate a new arrangement. The challenge is not restricted to TikZ, every LaTeX package that can be used to accomplish this (pstricks, etc.) is allowed. If you need an idea, how the whole thing could look like, compare the following image. Note that this example differs in two points from the specified criteria: Not all windows are rectangular and not all of them have the same size. I'll never be as festive and cheerful as Tom Bombadil so I won't even try. I just want to tackle the minimal problem using only LaTeX. The following code distributes an arbitrary number of nonintersecting rectangles (with independent sizes) inside a rectangular field. The algorithm is just brute force with a threshold limiting the maximum number of attempts to place a rectangle; if exceeded, an error is thrown. It's quite gross, but it works relatively well as long as there are just a few windows and these are much smaller than the field. Also, it's just eighty lines. Not pretty, but I think the criteria are all satisfied. I managed to throw some eye candy together while still keeping the code under 150 lines. Since the ordinary Christmas theme is already being adequately developed, I considered the alternative viewpoint. ( 7.33,8.60) .. controls ( 7.01,8.56) and ( 6.80,8.55) ..
( 6.65,8.56) .. controls ( 6.44,8.41) and ( 6.29,8.35) ..
( 6.16,8.33) .. controls ( 6.01,8.16) and ( 5.86,7.99) ..
( 5.80,7.96) .. controls ( 5.60,7.60) and ( 5.52,7.39) ..
( 5.44,7.17) .. controls ( 5.40,6.96) and ( 5.36,6.75) ..
( 5.34,6.49) .. controls ( 5.35,6.36) and ( 5.36,6.26) ..
( 5.41,5.98) .. controls ( 5.53,5.69) and ( 5.59,5.61) ..
( 5.66,5.50) .. controls ( 5.83,5.49) and ( 5.87,5.39) ..
( 6.18,5.56) .. controls ( 6.36,5.88) and ( 6.35,6.01) ..
( 6.40,6.15) .. controls ( 6.38,6.32) and ( 6.36,6.49) ..
( 6.30,6.69) .. controls ( 6.12,6.91) and ( 6.14,6.90) ..
( 5.90,6.84) .. controls ( 5.74,6.59) and ( 5.72,6.46) ..
( 5.76,6.14) .. controls ( 5.83,6.00) and ( 5.96,5.92) ..
( 6.07,6.07) .. controls ( 6.14,6.30) and ( 6.15,6.26) ..
( 6.02,6.31) .. controls ( 5.97,6.08) and ( 5.93,6.18) ..
( 5.89,6.29) .. controls ( 5.90,6.39) and ( 5.87,6.45) ..
( 6.00,6.68) .. controls ( 6.09,6.61) and ( 6.22,6.56) ..
( 6.20,6.17) .. controls ( 6.16,6.11) and ( 6.19,5.94) ..
( 5.91,5.84) .. controls ( 5.76,5.94) and ( 5.70,5.98) ..
( 5.61,6.46) .. controls ( 5.65,6.75) and ( 5.74,7.00) ..
( 5.85,7.14) .. controls ( 5.98,7.34) and ( 6.15,7.50) ..
( 6.34,7.44) .. controls ( 6.62,7.36) and ( 6.87,7.03) ..
( 7.05,6.71) .. controls ( 7.18,6.38) and ( 7.22,6.20) ..
( 7.25,6.01) .. controls ( 7.27,5.68) and ( 7.26,5.44) ..
( 7.23,5.26) .. controls ( 7.09,4.77) and ( 6.95,4.31) ..
( 6.78,3.95) .. controls ( 6.59,3.52) and ( 6.39,3.14) ..
( 6.20,2.90) .. controls ( 6.01,2.45) and ( 4.04,0.00) ..
(12.48,5.75) .. controls (11.81,5.90) and (11.44,6.16) ..
(10.71,6.44) .. controls (10.34,6.62) and (10.00,6.76) ..
( 9.44,7.10) .. controls ( 9.01,7.40) and ( 8.62,7.78) ..
What's this? What's this? There's color everywhere! What's this? There's white things in the air! What's this? I can't believe my eyes, I must be dreaming; wake up, Jack, this isn't fair! What's this? I admit the picture suffers from a distinct lack of spiders, snakes and shrunken heads. Maybe next year I'll get around to drawing some delightful surprises to hide behind the windows. 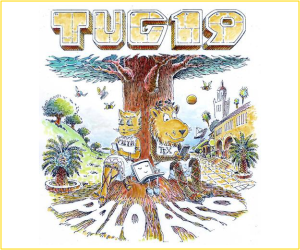 You can get the latest PDF containing all pages here (about 4.5 MB). Here's a first very, very basic version. 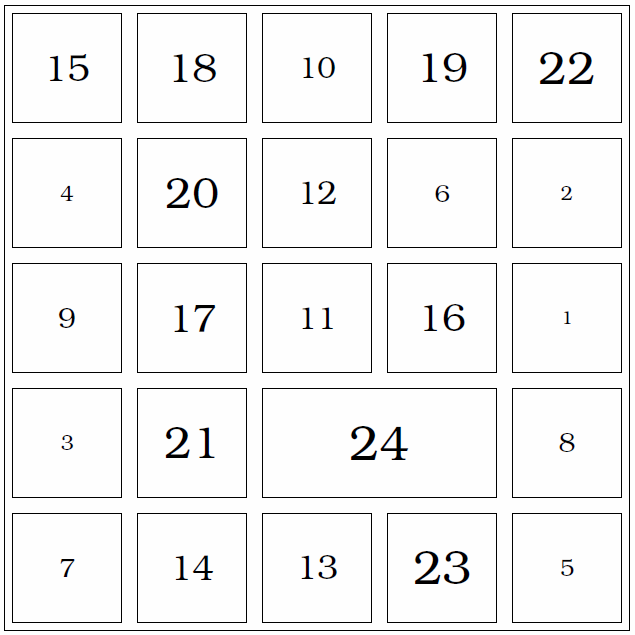 It places rectangles randomly on a rectangular grid, with the 24 being twice as big it makes a nice 5x5 grid. Furthermore, the font size increases with each day. 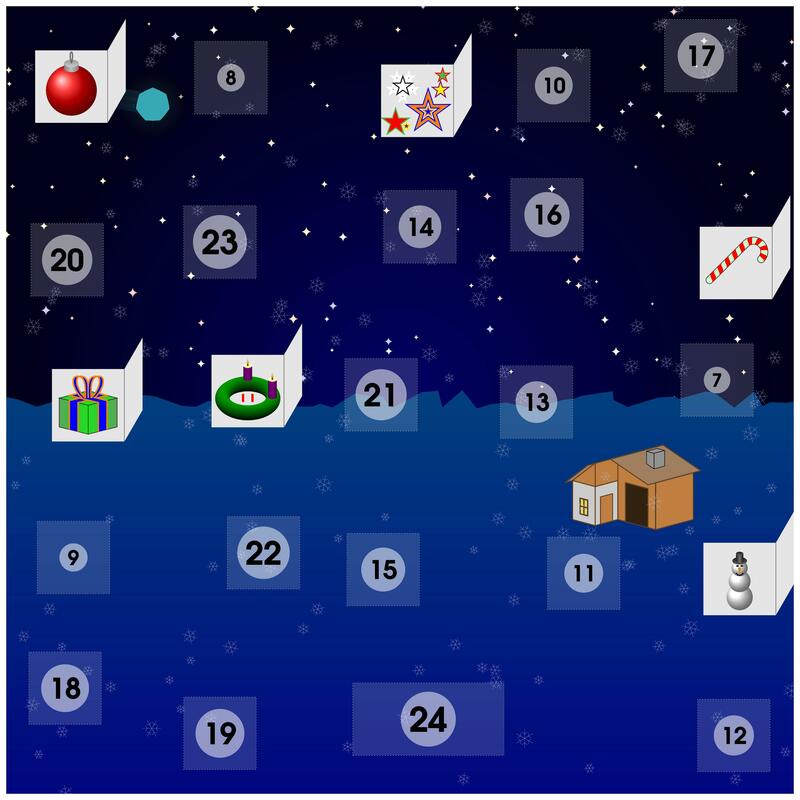 Update 1st December: There snow flakes now, and behind the first door was a shiny red ball! 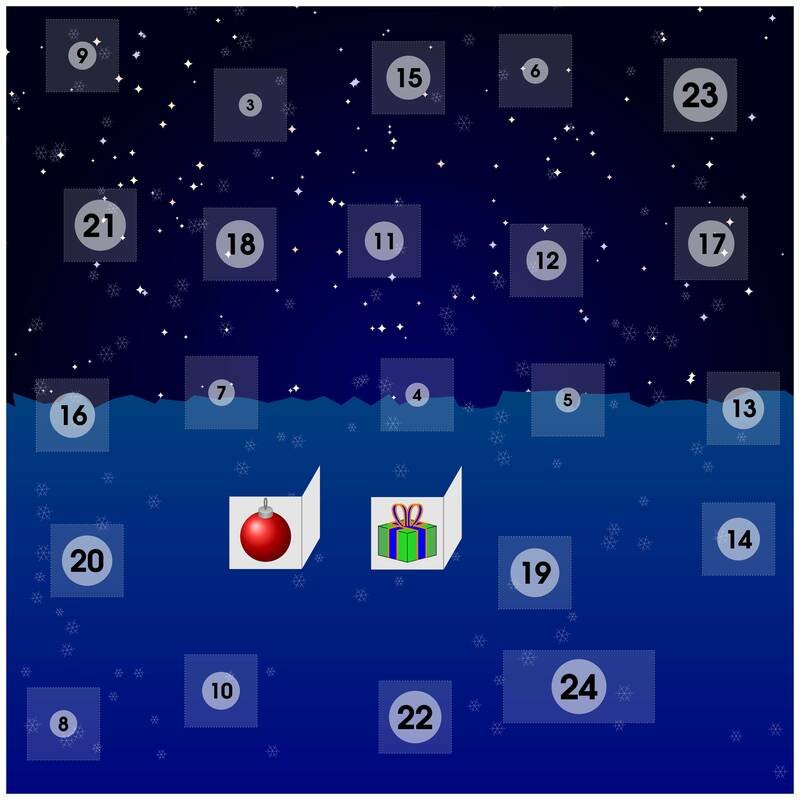 Update 2nd December: There are stars now, the red ball from yesterday has been magically transformed to a proper bauble, and there's a wrapped gift behind the second door! As this answer will get too long if I post the code every day, I will post only snippets leding up to the 24th and then the whole code. 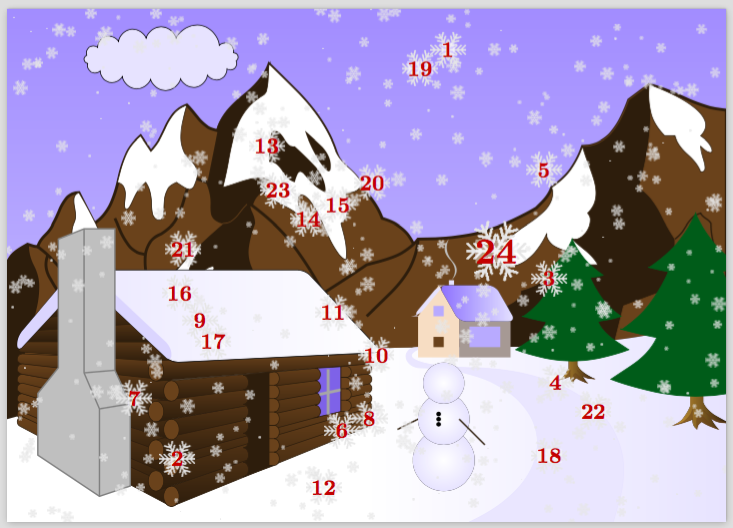 The small pictures drawing mechanism is inspired by "Drawing on an image with TikZ"
Update 3rd December: Today it's a snowman! Update 4th December: It's a minty candy cane! Update 6th December: Today it's an advent wreath with, surprise, two burning candles on it. Update 7th December: Today, it's a gigerbread person! Update 8th December: Today, it's a mistletoe! Update 9th December: Have some milk and cookies (with colorful crumbs). Disclaimer: Cookies are virtual. For enjoying real cookies, bake some. Share them. Spread the joy! Update 10th December: Do you know a famous character from Svalbard? 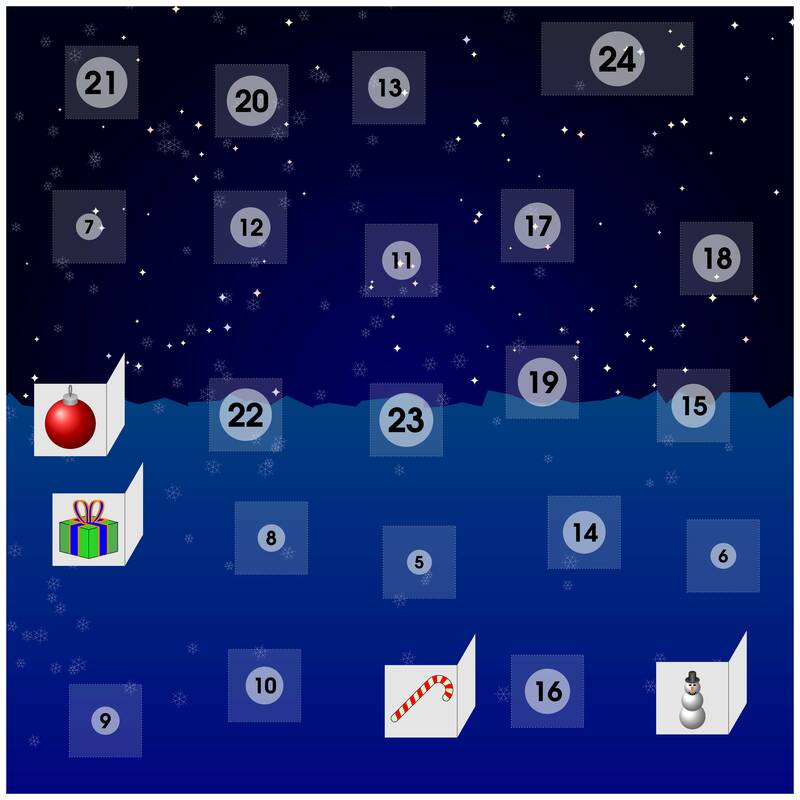 Update 11th December: Jingle bells, jingle bells, jingle all the way... with a little help from Jake. Update 12th December: Today it's a nutcracker, mideled after a genuine one from Erzgebirge, Germany. Update 13th December: Holy cow, is it the 3rd advent sunday already? Update 14th December: Don't forget your mittens when you go outside! Provided it's cold out, of cause. Otherwise, don't forget your sun screen! Update 15th December: If you haven't alrady, it's time to finish your wishlist! Update 16th December: Today in out winter collection: a nice warm red hat! Update 17th December: Last chance to catch the Geminids today! Update 19th & 20th December : A festive tree and an advent wreath with 4 candles. Also simpler and beeter looking trees. Here's my response to the challenge. Unfortunately it has a single flaw, which is the lack of collision detection for the nodes, since I have no idea how to do it and the lack of documentation on this topic didn't help (if someone could direct me to that, I'd appreciate it). However it was quite a lot of work (350 lines of code! ), so I'd like to post it anyways, even if just for that reason. The placement of the days should be random for each compile. Not the answer you're looking for? Browse other questions tagged tikz-pgf pstricks fun random-numbers or ask your own question. How to create a random math problem in LaTeX? How can one create a random GUID? How to Create Random Letter?